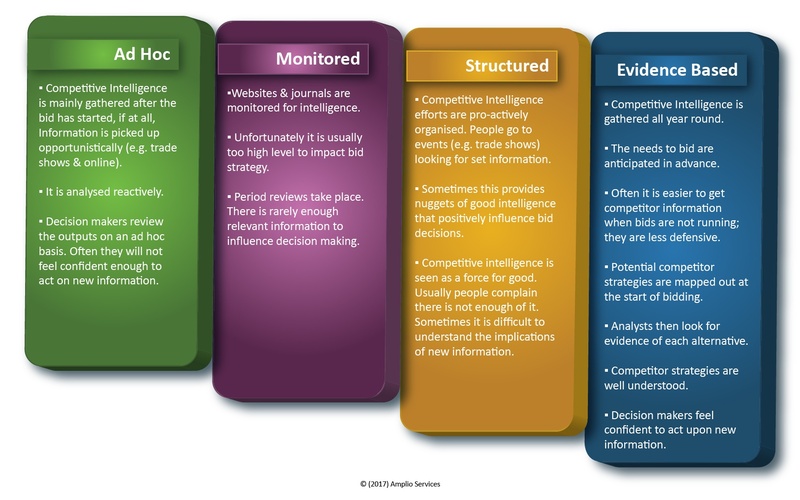 At Amplio, we have a competitive intelligence maturity scale shown in Figure 1 below. In our experience, most companies are either at the maturity where competitive intelligence is 'monitored' or 'structured', but we rarely find companies making truly 'evidence based' decisions. “Me too thinking” – When most people consider a key decision that a competitor will make, they will fundamentally think about whether or not they would do it. This is not the same as answering whether the competitor in question will or won’t do something, effectively it’s just answering whether you would do it if you worked for them. What we need are frameworks and evidence that get people away from their current mind-set and into an actual competitors mindset. SWOT analysis – SWOT analysis is descriptive and not designed to be a predictive tool. Creating a list of things that could happen isn’t especially helpful when we want to know what is likely to happen. Amplio's Black Hat reviews are based around Porter’s Four Corners framework. 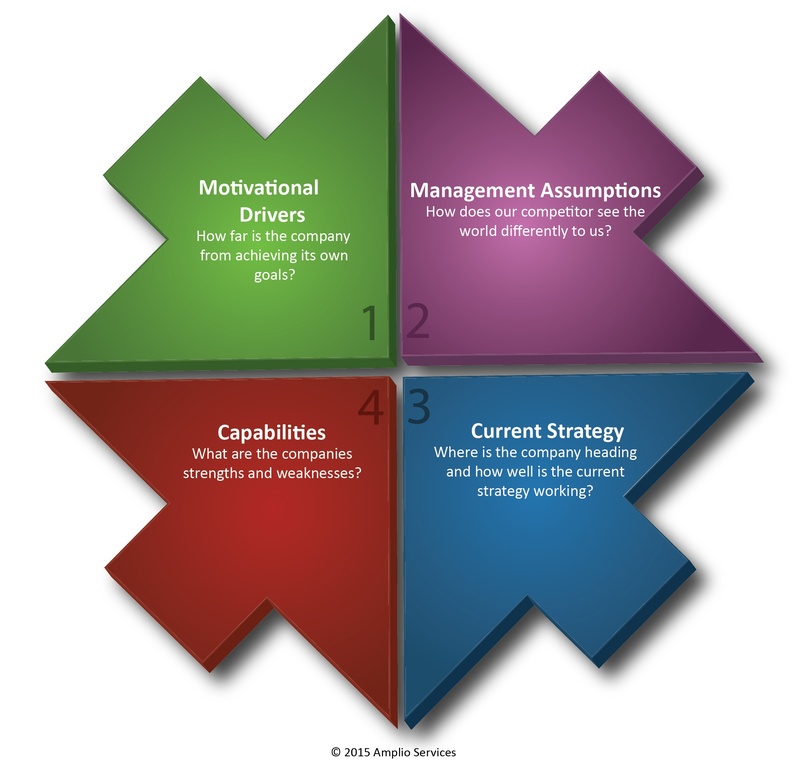 The Four Corners is a framework designed to predict future strategy. Leveraging ideas – Typically senior people and extroverts are more vocal in Black Hats. But their contributions aren’t necessarily better than quieter people who just happen to have introvert personalities. Amplio have a section of our Black Hat's dedicated to a 'predictive market' which is a way to bring out the knowledge quieter members have, but don’t often volunteer. Amplio have designed Black Hat agenda's that counter these common problems with Black Hats. Our agenda is designed around Porter's Four Corners limitations of SWOT analysis. We produce three documents as part of the pre-reading, these are analysis of the competitors, customer and relevant bids. These avoid 'me too' thinking and combined with the Four Corners framework, will get the participants into the mindset of the competitors. We use predictive markets to quantify predictions and ensure every participant contributes. We facilitate Black Hat's either within our Price to Win as a Service or as stand-alone events. Arrange a consultation to discuss how we can help you win more bids. See our blog where you can download our White Paper giving you more detail about how Price to Win works.